Since 2009, H. T. Harvey & Associates has provided on-call biological consulting services to the Santa Clara Valley Water District (district) under three successive Master Biological Services Agreements. Our work, which is ongoing, has entailed more than 100 different task orders to date, covering a wide range of biological resources issues. While providing these services, H. T. Harvey & Associates has worked closely with district staff to develop a process to perform these on-call tasks as efficiently, cost-effectively, and thoroughly as possible, essentially serving as an extension of district staff to perform whatever tasks requires. South County Water Recycling: Master Plan EIR/EIS. H. T. Harvey & Associates prepared a biotic study that served as the basis for an Environmental Impact Report/Environmental Impact Statement (EIR/EIS) for the first phase of the project, and which will also serve as the basis for a program-level EIR/EIS for the project as a whole. Coordinating extensively with district staff and others regarding biological resources issues, we prepared a draft Biological Assessment covering Phase 1 activities. Sunnyvale East/West Channels Flood Protection Project: Wetland Delineation and Habitat Study. We performed a delineation of jurisdictional wetlands and other waters and prepared a habitat/impact assessment for selected sensitive species; we also prepared reports summarizing both efforts. This work applied to a project area that included the Sunnyvale East and West Channels and Pond A4. Adobe Creek Upper Reach 5: Woodrat Monitoring. H. T. Harvey & Associates conducted Year 1 monitoring surveys of San Francisco dusky-footed woodrat nests to evaluate the success of woodrat mitigation measures. Pond A8/A4 Sediment Disposal Monitoring. We monitored salt marsh harvest mice and California Ridgeway's rail during the district's disposal of sediment at Ponds A8 and A4. 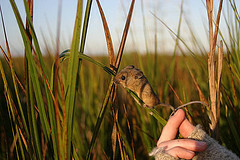 Coyote Creek Reach 1/Coyote Slough: Salt Marsh Harvest Mouse Trapping. We performed trapping surveys of salt marsh harvest mice in the vicinity of Coyote Creek Reach 1 and Coyote Slough; we evaluated the species’ distribution in creeks and sloughs of the South Bay and made recommendations for future management of Reach 1. 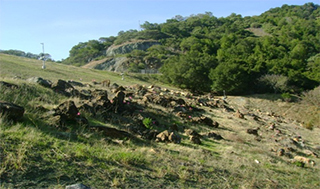 Special-status Species Surveys of Burrows on SCVWD Dams. 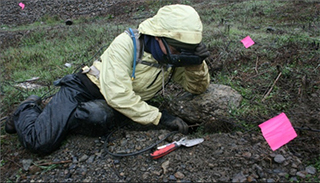 Under three task orders, we conducted surveys of mammal burrows on 13 dams at 12 district facilities using fiber-optic equipment, and assisted with the filling of burrows after we had cleared them of sensitive species. 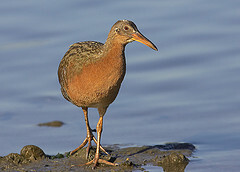 Advanced Recycled Water Treatment Facility: Nesting Bird Surveys and Deterrence. Under three task orders, we conducted surveys of burrowing owls and of the nests of other migratory birds during various phases of the project. From early March through May , conducted an intensive nesting bird deterrence effort (e.g., we removed nesting substrate and nest starts) to deliver the site to the construction contractor without any nesting bird–related constraints. 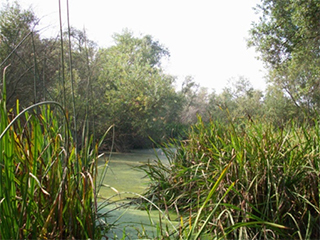 Stream Maintenance Program/Lower Llagas Creek Riparian Vegetation Mapping. H. T. Harvey & Associates helped to perform aerial photo-interpreted vegetation mapping for the SCVWD’s Stream Maintenance Program update and for a project along lower Llagas Creek.